Elektra / Michael Kieran Harvey collection. Michael Kieran Harvey is one of the foremost interpreters of contemporary piano music of his generation. A champion of Australian music and himself a composer, he regularly commissions new Australian music and has performed Australian music with Australia's leading contemporary music ensembles and orchestras. ...'I had spent some time exploring the intersection between what a composer hears, then realises on the computer, and then what is humanly possible in live performance. Ives, Nancarrow, Ferneyhough, Stockhausen, Boulez and others had been pushing these boundaries well before the rise of the PC but the ease and complexity of computer-generated music for the piano now begs the question: what is the performer for? 'If the performer will only be able to execute the score with varying degrees of failure, what is the point in attempting it in the first place? Should the composer ignore his/her own creative desires and only write what is comfortable for the performer and audience? It boils down to whether humans wish to listen to intelligent machines or other humans. The answer seems to be: it depends. The prosthetic integration of artificial intelligence with human intelligence is an increasing fact of life within art. One wonders though whether an intelligent machine would ever want to play or listen to music for its own satisfaction. Booklet includes programme notes and biographical information on composers. Score: Menin Gate / Helen Gifford. Score: Sonata : for piano / Julian Yu. Score: Folly : for solo piano / Andrew Ford. 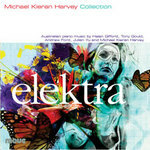 Score: Elektra : for solo piano / Michael Kieran Harvey.